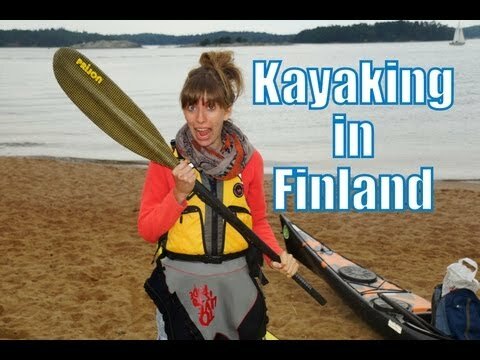 In search of adventure sports, we went Sea Kayaking around Kimito Island, Hogsara and the Finnish Archipelago as part of our travel experience with Visit Finland. Okay, so today we’re going to go Sea Kayaking and we’re visiting some of the islands around the Archipelago here in Kimito Island and I’m all suited up to go out in the water. Hahaha! You sure are. Hello, I’m Benjamin. I work as a Sea Kayak guide in the Archipelago sea. It’s a natural park. We have a lot of people from abroad who are coming here knowing about the Archipelago sea and want to see what it is like here. And Sea kayaking is really a good way to experience the wilderness. So how is the kayaking going so far? It’s going great. We’re just taking a short little break and came across some sheep who are just grazing by the sea. I guess by the sea. And my legs fell asleep so I had to get out for a while. But other than that it is going awesome. No capsizing so far. No. Very graceful. Hahaha! I got the video. You’re still alive? Hello, I arrived. Still dry. Soaked little puppy. I am. I managed to make it the entire sea kayaking journey without capsizing. At the very end I flipped the boat over when I was getting out. So this was an awesome experience. We went sea kayaking and we were just paddling through wilderness and these small little islands where we saw different kinds of wildlife. All kinds of different birds. It was just awesome and it was a real workout too. We did this for a few hours. I’m exhausted now but loved every minute of it. Okay, so I was told that usually one in ten people capsize the kayak. I survived the whole four hour journey. I am still dry so I think I did pretty good. Early on I even thought that you’d come across the Goats On The Road 😉 then realised they were in fact sheep.